Bridging the Divide Between Immigrant and African American Musilms by Utilizing the Concept of Tawheed as the Catalyst. The Islamic community boasts of being one united community. Its cornerstone belief is Tawheed (oneness of G-d). Its fundamental principle is the Unity of G-d, and this speaks to the unity of humanity. Yet when you look at the Islamic community over its almost fifteen century history, racism, prejudice, bias, and discrimination have continued to prevail. 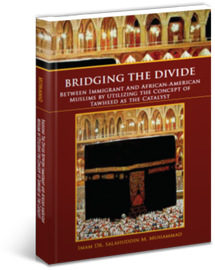 In the pages of Bridging The Divide Between Immigrant and African American Muslims by Utilizing the Concept of Tawheed as the Catalyst, author Salahuddin M. Muhammad argues that the Islamic community has suffered fragmentation as a result of this artificial divide. Therefore, the one united community has been more of an ideal than reality. He contends that really understanding the concept of Tawheed is the true answer—the bridge—as it were—to overcoming this artificial divide, the divide that separates the immigrant Muslim from the African American Muslim. Books will be shipped out within 72 hours of purchase. We offer shipping within the United States only. No International shipping at this time. We accept credit cards using Paypal to process payments . Click to find out more about Paypal.